My son’s 3x great grandparents, James Gray and Isabella Thompson. Photo c. 1890. Source: Peter Duncan / Gray family archive. Since I wrote the most recent post about my son’s paternal line (Opening the door on a new journey), I have been contacted by two relatives from the Gray branch of that family. Both have provided me with useful background information and in one case, photographs. We knew that Andrew GRAY was the only one of my partner’s great grandparents not born in New Zealand. My father-in-law believed that his grandfather came from Scotland, probably from around Glasgow, but wasn’t really sure. Although the ship’s manifest shows Isabella’s surname as Gray, I know from James’ Will that her maiden name was Thomson. Gray James Gray, Carter in Glasgow, Isabella Thomson residing there, married 16th July by Mr John Graham, Independent Minister in Glasgow. 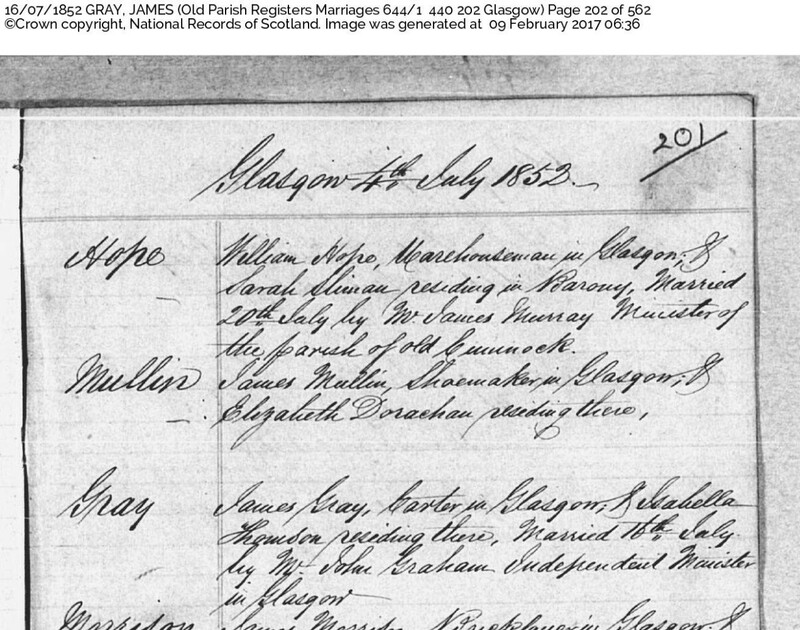 Marriage record, James Gray and Isabella Thomson, 1852, Glasgow. Source: Scotland’s People. To corroborate this, I searched for birth records the Gray children listed on the Matoaka’s passenger list. The eldest, Isabella, was shown as aged 7 in December 1860, so was probably born around 1853. However, a search in Scotland’s People didn’t find any records — in Church of Scotland, Catholic or other parish registers of any children called Isabella (or name variants) born to James and Isabella Gray/Thomson (name variants included here too). 1855 was the year in which compulsory civil registration of births began in Scotland — taking the place of parish registers. As all the birth records I found for the Gray children are post-1855, I’m wondering if perhaps James and Isabella’s children weren’t baptised (at least not in churches for which records have been digitised). Andrew’s birth registration tells me that James was aged 33, a mining labourer and born in Garnkirk, a settlement near the southern border of Cadder parish. Isabella was aged 30 and had borne two other children: one girl, living — Isabella; and a boy, deceased. Isabella Gray Maiden name Thomson ?? 3rd child 30 Years, Muirkirk??? From birth record, Andrew Gray, 1855. Source: Scotland’s People. As to her place of birth: I’m having trouble reading the hand-writing on the record. It looks like Muirkirk — a small town in Ayrshire. My usual method for unraveling ancestors’ lives (certainly those born in the 19th century) involves beginning at the end — with death certificates. In Scotland, these include the deceased’s parents’ names, father’s occupation and whether the parents were alive at the time of their off-spring’s death. 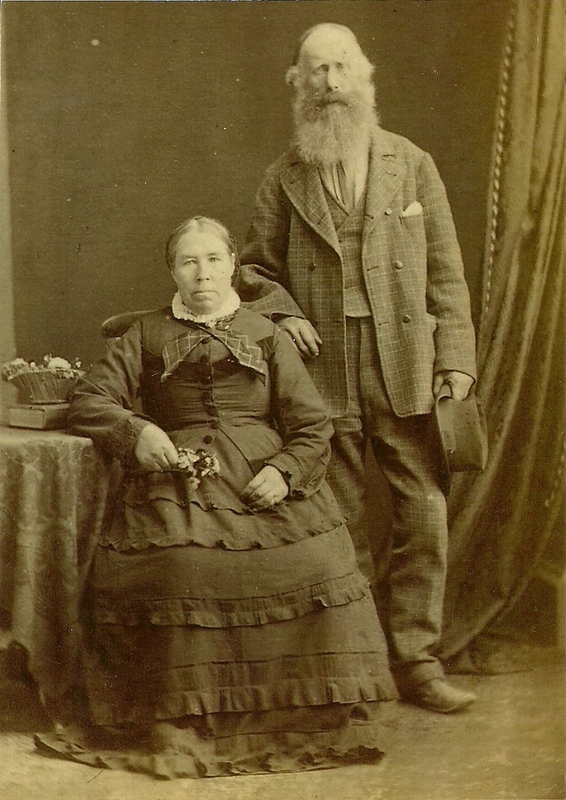 Because James Gray and Isabella Thomson left Scotland in 1860, their deaths occurred in New Zealand.And while that may be convenient, death certificates here are costly to obtain and, in my experience, contain very limited information. I have searched Scottish records for James and Isabella’s births, and have found several possible matches for each. However, in the absence of any corroborating evidence (parent’s names for example), it isn’t possible to be sure which (if any) of these records is correct. I will have to “bite the bullet” and order their NZ death certificates and hope that they are more informative than others I’ve accessed. In the meantime, I plan to work forward, from their arrival on the Matoaka, to the lives they and their children built in their new country.